1 pc. 27,47 EUR ea. You need all your wits for this game! The Tangram cube (80 x 80 x 80 mm) consists of 24 magnetic plastic pyramids. With these tetrahedrons you can also build more challenging shapes and figures. You can use the 20 enclosed templates with detailed instructions for inspiration. 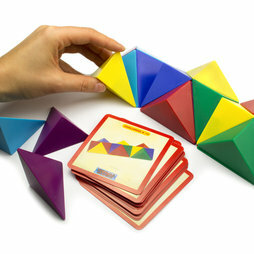 The different levels of difficulty ensure that creating magnetic structures is fun for young and old. Embedded ferrite magnets, which are considerably weaker than neodymium magnets, are responsible for the magnetic attraction between the pyramids. Therefore, there is no danger of pinching your fingers in between two triangles. The Tangram cube is suitable for children age 4 and above. Playing with this cube enhances fine motor skills and spatial sense as well as understanding of magnetism. An entertaining and educational toy, suitable for kindergartners and above.